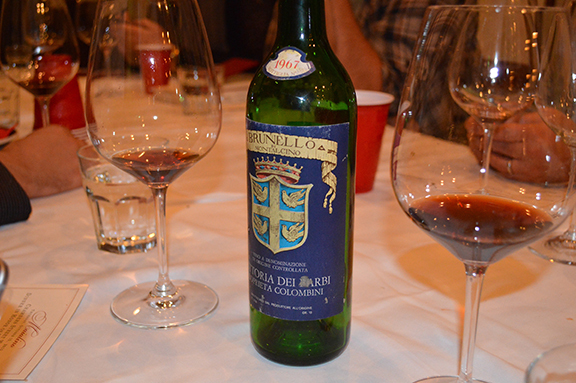 Above: The 1967 Fattoria dei Barbi Brunello di Montalcino last night in Manhattan. Note the color of the wine in the glass to the left of the bottle. The Montalcino Blog by Barbi is devoted to the life and times of Montalcino and Brunello di Montalcino. But every so often, as blogmaster, I get the opportunity to share my own personal thoughts and impressions here. On this beautiful fall day in New York, I just had to post a note about the 1967 Fattoria dei Barbi Brunello di Montalcino that I had the great fortune to drink last night here in Manhattan at Maialino in Gramercy. The occasion was a private dinner hosted by Chambers Street Wines owner Jamie Wolff to celebrate Italian wine writer extraordinaire Walter Speller, a contributor to Jancis Robinson’s Purple Pages and the author of the Italian entries in the Oxford Companion to Wine, edited by her with fellow Master of Wine Julia Harding. Walter was in town for the presentation of the fourth edition of the OCW and Jamie had gathered a group of high-level collectors and flight of extraordinary rare wines from Italy. Of the nine wines poured at the dinner, the Barbi was a highlight, bright and fresh in the glass, with zinging acidity and vibrant fruit. A truly spectacular wine, with classic Sangiovese notes of red stone fruit, a very fine example of what classically made Brunello can deliver with decades of aging. What a wine! More than one guest remarked on the fact that 1967 (my birth year!) isn’t considered a “great” year. This wine showed the even in simply “good” vintages, Montalcino can produce long-lived wines thanks to the diversity of its macro- and microclimates. I happened to be sitting next to another notable wine writer last night. She turned to me and said, “Jeremy, I want to go to Barbi!” That’s how good it was. I haven’t had a chance to ask Stefano about the vintage and the wine but I can’t imagine that there won’t be a forthcoming post. Stay tuned… and Stefano, thank you for this extraordinary wine!